This article was first published in the Aquarius in Spring 2003. I recall Vic saying that our Lafayette Morehouse property should be named "Here" and all the clocks should be set to "Now". Hence the names the "Here Road" and the signs around the property that read "Here". There is a clock around Here that has the word "Now" at every hour marker instead of a number. We tell people that all the houses Here are purple so there is no mistake that one has changed realities should they wander onto our property. We don't exactly make it easy to find, so hardly anyone ever actually "wanders" on; therefore it is safe to assume that anyone who is Here got Here by his or her own determination. This is especially accurate if they walked in one of the gates, which have signs posted reading, "Do not enter uninvited unless you want to get your feelings hurt". 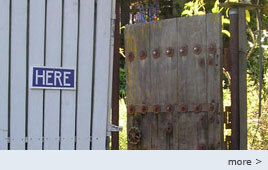 It only seems fair to warn trespassers and newcomers that the reality Here may be different from elsewhere. "How is that?" you may ask. Here are a few of the ways. For starters, we'll view you as a perfect being, a potential playmate, not someone who needs to be fixed, improved, reformed or made-over to be good enough. For another, we hold you responsible for everything! For a perfect being, this is not a burden but an enlightened point of view from which to share one's life, which brings up our communal lifestyle. We share not only Vic's philosophy of perfection but houses, gardens, vehicles, parenting and elder-care, a recreation area, as well as our business of courses, groups and houses. Both women and men take turns being "maids" in cute or handsome black-and-white uniforms and take charge of the ambience for specific time periods. As the time is always Now, we observe a 24 hour clock; several of us are prepared to handle whatever comes at any now. We have a beautiful land holding of 20-some acres, one of the largest privately held properties in this area. There are fabulous views in all directions. The full moon rising over Mt. Diablo inspires instant deck parties. Our uphill side shares a boundary with regional parkland with hiking trails up to the crest of Lafayette Ridge. Only a few of our acres have been developed, leaving a delightful wilderness that shelters deer, foxes, coyotes, raccoons, skunks, opossums and many birds, including hawks and a struggling flock of California's endangered state bird, the adorable earthbound California quail. The flock was almost extinct until the recently-arrived coyotes ate the feral cats that infested the woods and were eating them. A mountain lion was sighted Here some years back. The woods are composed of several kinds of oaks, including elegantly contorted valley oaks, bays, buckeyes, and remnants of old almond and walnut orchards. These are accompanied by plenty of poison oak (watch out! 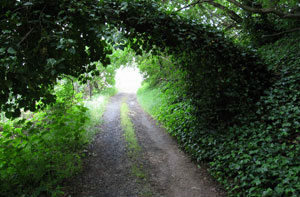 ), and in the summer you can pick blackberries at several big patches. 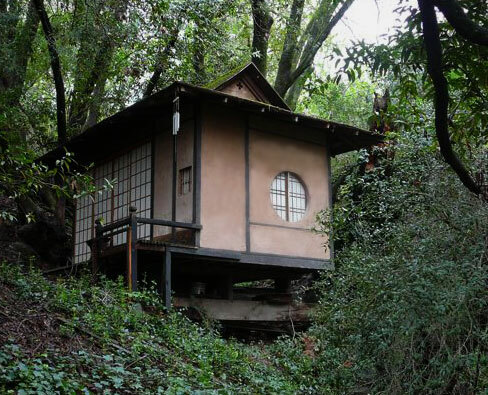 Tucked away in a particularly lovely spot in the woods is a beautiful Japanese tea house. Also in the woods there is Napa's Camp, a cluster of rustic cabins perfect for romantic retreats. Cascading through this little resort is a small stream that is dammed below to create a heart-shaped lake, Lake Cindy, Vic's unique gift to Cindy. The lake attracts wild waterfowl, the iridescent jewel-toned mallards, pristine white herons, red-winged black birds, swifts and other small birds plus really big frogs that croak out strident love songs to their mates and tadpoles in the Spring, their cacophony resounding up and down the hill. Next to our large swimming pool and two tennis courses is the club house, The Puhi Paka Waipuna Lounge where we have parties, meetings and courses. The Garage is the oldest structure on the property legend has it that it originally served as a Wells Fargo stop in the 1850's. When the Barancos purchased the Main House parcel in 1970 it was an actual mechanic's garage, even had one of those recessed bays in the floor. Now it is a warren of bedrooms. Most bedrooms Here used to be something else. For a while, the Main House had no kitchen because no one wanted to cook, so Vic converted it into a bedroom. These are a few of the ways it's different from the norm Here. Well, it's Now — I gotta go. Whoops, I'm still Here Now. See you.